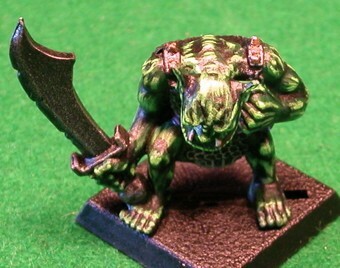 This is the original plastic ork model released for Warhammer Fantasy Battle. It came in a box of thirty other models, five from each race. I bought it when I got talked into playing Orks and Goblins. Goblins and High Elves came in the first Warhammer Boxed Set, the goblins still aren't finished but they are close. There were other plastic orks and goblins released that were available at the time, I liked variety. I traded away the Dwarfs but I think I still have the Skaven, Wood Elves, Dark Elves and of course the Orks and Goblins. I recently stripped the Dark Elves, well a year or so ago. Someone talked me into letting him paint them, he never finished them so after sitting half finished for ten years I stripped them. I may never do another new army but if I ever do Dark Elves would be a favourite because their range is one of the best looking GW has ever made. In the mean time I'll keep paint Orks and Chaos for both fantasy and Warhammer 40K.